The sleeves on Arteaga’s shirt had to be rolled up because, as he recalled, Blessed Rother was a tall man. “He learned to speak Tz’utujil, the language of my people, and he always served the people most in need,” Arteaga said. 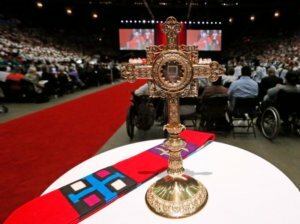 An estimated 20,000 packed the Cox Convention Center from across the country and throughout the world to witness the beatification of the native Oklahoman who would become the first U.S.-born martyr. Blessed Rother prepared for the priesthood at Mount St. Mary’s Seminary in Emmitsburg. Ordained for the Archdiocese of Oklahoma City in 1963, Blessed Rother went to the archdiocesan mission in Santiago Atitlan. He was gunned down in his rectory by three masked men in 1981. Pope Francis recognized the priest’s martyrdom last December, making him the first martyr born in the United States and clearing the way for his beatification. Father Don Wolf, a cousin of Blessed Rother, made an appeal for continued support of the missions the martyr served in Santiago Atitlan and Cerro de Oro. “For the people of his parish in Santiago Atitlan and Cerro de Oro and all of us here in Oklahoma, he has led our eyes unwaveringly to the kingdom of God,” Father Wolf said. It was for Father Wolf’s ordination in May 1981 that Blessed Rother made his last visit to the United States, which Father Wolf said is a distinction that links his priesthood to his cousin’s. Francisco “Chico” Chavajay, program coordinator for Unbound Project in Guatemala, was only 1 when Blessed Rother was killed, but grew up in San Pedro, which is near Santiago Atitlan, knowing who “Padre Alpas” was and the impact he had on the community. Chavajay now works for Unbound, an U.S.-based organization founded in 1981 by five lay Catholics, including one who had worked with Blessed Rother in Guatemala. Unbound works with children and the elderly in poor and marginalized communities throughout the world. In Guatemala, Chavajay is responsible for serving more than 60,000 families. Seminarians Estevan Wetzel and Ian Wintering from the Diocese of Phoenix traveled to the ordination with a group of fellow seminarians attending St. John Vianney Seminary in Denver. They were introduced to Blessed Rother’s story through their Oklahoma brothers. “His ordinary ‘yeses’ came with a great faith that at the end allowed him to receive a martyr’s crown,” Wetzel said. Sister Gabina Colo, local superior of the Missionary Sisters of the Eucharist in Houston, brought her community to the beatification. Father Guillermo Trevino traveled from the Diocese of Davenport, Iowa, for the beatification. Serving in an area that relies heavily on agriculture, Father Trevino was impressed at Blessed Rother’s “ordinariness.” The future martyr was raised on his family’s farm about three miles from Okarche. “The thing is he was so ordinary, but he had great gifts. In Guatemala he’d be working the farm,” said Father Trevino, finding inspiration in his example. In particular, he pointed to a line the late priest uttered that illustrates the devotion he had to his flock: “The shepherd cannot run.” “Can I do this?” Father Trevino has asked himself. She now lives in Danube, California, with her husband, Robert Cervantes. They said the government at the time considered teaching the Tz’utujil to read a threat.